This Friday come join Dane Holdings for our annual shredathon! 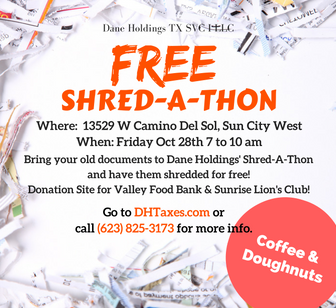 Shred your unwanted documents this Friday October 28th between 7am and 10 am at our Sun City West office located at 13529 W Camino Del Sol. We will be serving donuts and coffee. The Sunrise Lions club will also be there accepting donations for glasses and hearing aids. The West Valley Food Bank will be there accepting food donations. For more information please call our office at 623-825-3173.